WASHINGTON(Feb. 14, 2005) -- Stanley Levine is a man of extremes. 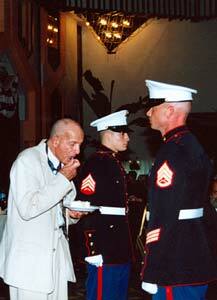 Caption: Iwo Jima veteran Stanley Levine eats cake at the Marine Corps birthday ball. Of the Corps Levine said, "Sometimes you love it, sometimes you hate it, sometimes all in the same day, but always we are faithful to our country and our Corps." Photo by: Courtesy photo. At 79 years old, the Brooklyn, N.Y., native is the oldest Peace Corps volunteer ever recruited and is loving life in his service to the country of Cameroon. The spirit of volunteerism that drove him to the Peace Corps goes back more than 60 years, when he joined the Marine Corps on the delayed entry program, because he wasn't old enough and had to wait until he finished school to go to recruit training. During a recent trip back to the U.S., Levine was photographed for Peace Corps advertisements aimed at older Americans, a rapidly expanding demographic within the ranks of the Peace Corps. Despite having lived a full and productive life, he is not ready to rest just yet. There are scars and tattoos of a life lived to its fullest that cover his body, but the mind is marred by no complications. During the photo shoot his quick wit and determined nature left no question whether this hard-core veteran was up to the task at hand. "Will this make me famous?" Levine jokingly asked. "I'm told that my right profile is good," he said as a photographer adjusted the lights glinting off his mischievous eyes. As he turned slightly with the photographer's directions, he added, "But my left profile is gorgeous." Such statements are typical of this dynamic volunteer. He says everything that comes to his mind, usually resounded by the laughter of everyone around him. He is full of life that defies his age, and he loves sharing it with other people. For Levine, he is doing the best thing he can. He is serving something greater than himself. And according to him, he's getting a lot more than he bargained for. A veteran of the Marine Corps' island hopping campaigns of World War II, bearing a remembrance of Iwo Jima, Guadalcanal and the Solomon Islands, Levine summed up much of his feelings when he spoke at the 229th Marine Corps Birthday Ball at the U.S. Embassy in Cameroon. "I would first like to say, no Marines have ever looked better than they do right now," Levine began his speech, recognizing the Marine Security Guards present. "I am happy for the diversity I see within our Corps today." From there, he reflected on the similarities and differences between the two Corps, much to everyone's delight. "For recruits in either Corps, the reality is far worse, and far better than you could ever imagine before leaving for training. But in the end, there is a sense of belonging that is beyond anything you could ever imagine. You have many sacrifices to make, proving that both Peace Corps volunteers and Marines are equal parts courageous, rebellious, patriotic, and sometimes ... a little crazy. Why else would we agree to do the things we've done?" Levine also remarked about how Esprit de Corps was much easier in the Marine Corps, since Marines are always clumped together, and Peace Corps volunteers tend to be dispersed to cover the many assignment areas around the world. In his final remarks though, Levine made his strongest link between the two organizations, he said, are the best at what they are designed to do. "Sometimes you love it, sometimes you hate it, sometimes all in the same day, but always we are faithful to our country and our Corps." Levine teaches English as a second language at the Cameroon University as part of his Peace Corps service, and has begun sponsoring a football club for the school, which has never had an organized sports curriculum. 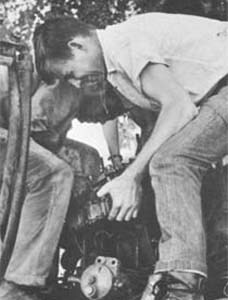 A former Marine Corps Combat Correspondent, A. Lyn Bell earned several journalistic honors both in and out of uniform during his tenure in the Corps. He began his service in the Navy prior to Desert Shield/Desert Storm where he toured the Persian Gulf as a Tactical Assault Boat Coxswain before becoming a Marine. His service spanned more than13 years before a fast-roping accident ended his career. Since leaving the Corps he has committed his time to leading volunteer youth organizations, writing, and being a public school teacher. He is currently serving in the Peace Corps.